While the release of Stench of the Sea contains several maps, I’m always up for creating more – and they might find their way into a future update of the supplement – who knows. 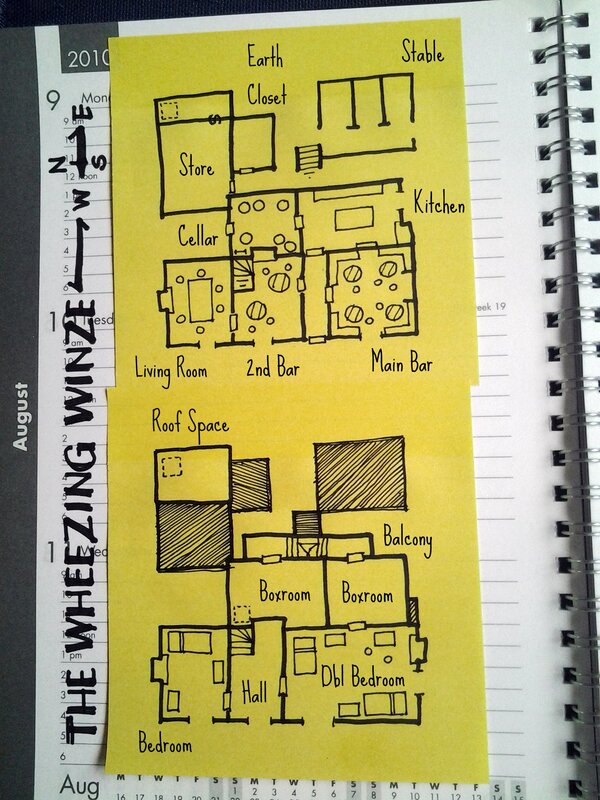 Here we have a floorplan for the Brinwan’s inn, The Wheezing Winze. Run by Colm Wain, with his wife and twin sons, it serves as the main meeting place and drinking hole for local farmers and fishermen, as well as travellers. Colm and family normally sleep in the rooms marked as boxrooms. However, Colm will adapt to demand. The left boxroom holds most of the family possessions, normally sleeping Colm and his wife; the twins can sleep elsewhere if high demands require use of the right boxroom for travellers. When in heavy use, Colm secures the door between the right boxroom and double bedroom. The double can also have additional pallets brought in to provide a communal sleeping arrangement for large groups. The cellar holds many barrels of various local and imported beers, with a small stock of mead and bottles of wine. I drew the store slightly too tight to the main building. You can push between the cellar and the store to retrieve food supplies – held in boxes, sacks or hung in the cold store. Previous Stench of the Sea RELEASED!